Carob is a naturally sweet pod- technically a legume- which is often used as a low calorie / low fat / non-stimulating substitute for chocolate. We’d argue that carob is delicious in its own right but these biscuits do have something of the choc-chip-cookie spirit about them…. 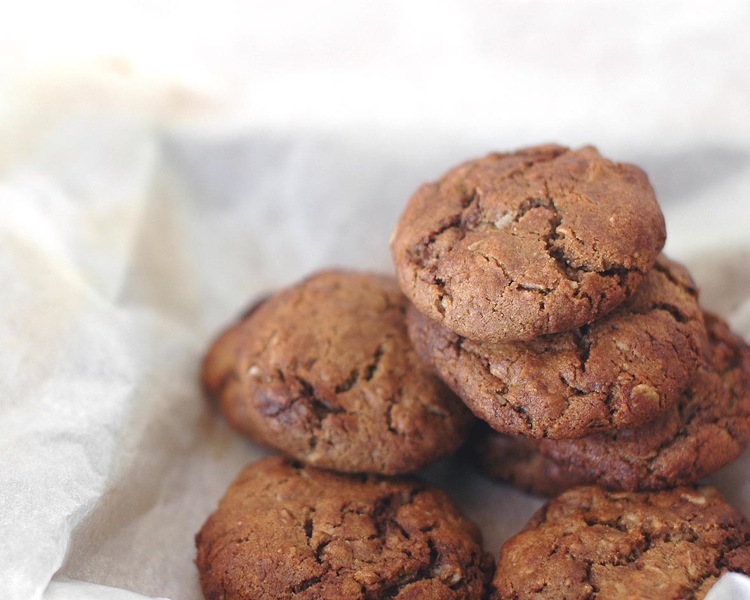 being packed with carob syrup, rolled oats, shredded coconut, wholewheat flour and tahini they’re just a considerably healthier treat! Perfect for children’s lunchboxes. 1. Preheat oven 180°C and line two slide trays with baking paper. 2. Sift flour into a medium sized mixing bowl and stir in oats and coconut. 3. Very gently warm coconut oil, carob syrup and tahini in a small saucepan, stirring, until combined. Remove from heat and cool. 4. Combine water and bicarbonate soda in a small bowl or cup and add to the wet mix. Pour over the dry mix and combine well, adding carob pieces. 5. Using wet hands (so that the mixture doesn’t stick) roll the dough into tablespoon sized balls and place on the trays at least 3 cm apart. Flatten each biscuit slightly with your palm. 6. Place in the preheated oven and bake for about 10 minutes, or until the tops are crackled and set. Cool completely on trays and store in an airtight container for up to 3 days.